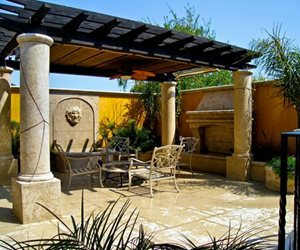 The column wraps on this open-roof pergola have a foam treatment with a limestone slurry painted on, which gives them the look of cast concrete or stone. 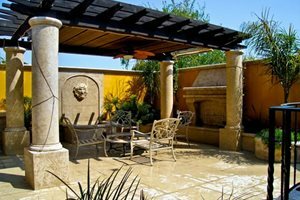 Faux stone is a much pricier process than other decorative column options. Clamshells, or column wraps, are a great way of matching the columns on your pergola with the styling of your home. 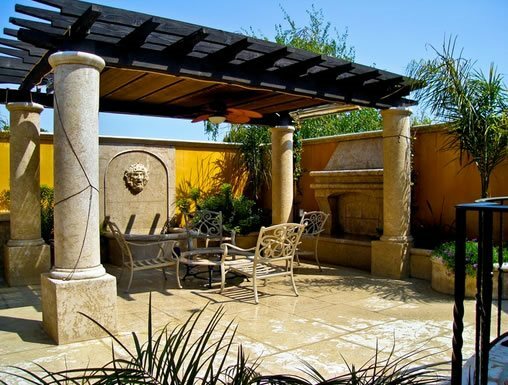 Dan Berger of LandPlan's Landscaping, Inc. in Pleasanton, CA recommends them highly because you can get the look of stucco, cast concrete, or stone for your columns without the expense and difficulty of using those materials. The clamshells fit over a wooden post, and are made of materials like spun fiberglass, vinyl or metal. Outwater Plastics Industries is well-regarded source for column wraps. 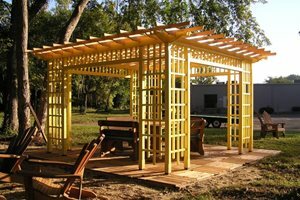 Columns and cross beams are an integral part of your pergola design, affecting sturdiness, appearance, and how much light it screens out. Columns run vertically and hold up the cross beams, which run horizontally across the roof. Lightweight rafters rest on the cross beams and provide much of the screening from the sun, while the small stringers are set atop the rafters and give a filtered effect to the light. When considering the aesthetics of the design, Aakre starts by analyzing the home and surrounding landscape to see if there are any existing elements he can incorporate into the pergola (see Landscape Design Styles). “Is there a style or an existing accent we can bring into the design so it looks like it belongs with the architecture?” he asks. There are many options for how to style and finish the pergola, ranging from rough-hewn beams that look good with a rustic country farmhouse to elegant white columns for a more classic style. 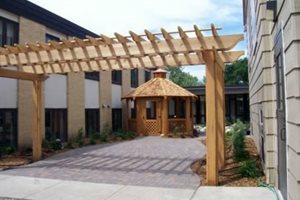 Pergolas work well with any number of architectural styles. The key thing to remember is to start your design by looking elsewhere in the home or landscape and drawing on themes already present on the property. Rustic or farmhouse landscapes mesh well with rough-hewn wooden posts and beams, either naturally weathered or stained. English or French landscapes are two of the styles that suit the classic gazebo, an eight-sided, solid-roof shade structure. 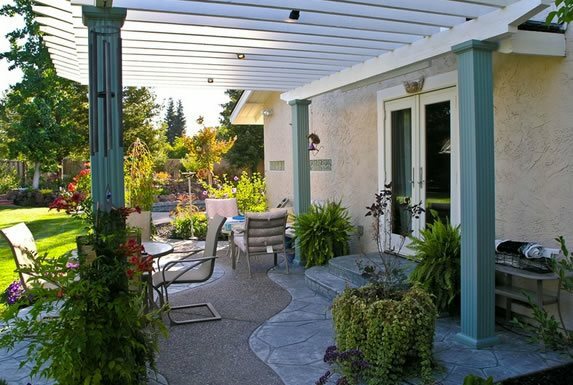 A painted white pergola also goes well with a traditional landscape style. Colonial or Cape Cod homes call for elegant columns as pergola posts to match the entry design. The columns, beams, rafters and stringers also play a functional role in screening out the light. While the beams, rafters and stringers cast shade from above, the columns play a part by screening the sun from the sides. The closer you place these elements to one another, the more shade you’ll cast. The direction you place the rafters also makes a difference in how much sun you screen out. “If you’re going to be out at three in the afternoon on your patio, ideally you would want your rafters going from northwest to southeast, but if you’re going to be outside in the evening, you’d want the rafters going north to south to block out that western sun,” says Aakre. Biedenweg also points out that the size of the structure itself will factor into the choice of columns and cross beams. “The number of posts and beams is determined by the amount of span vs. the amount of loading on that span,” he says. For large projects, an engineer may need to be involved to make sure the columns and cross beams can hold the weight of the structure without sagging. 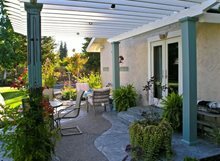 Overall, a pergola is an attractive way of inviting you and your family outdoors, since it evens the effects of extreme heat and creates a haven from which to enjoy the outdoors in comfort.